Yankee Candle Breast Cancer Awareness in Mandarin Cranberry ($14.99) Buy 1 get 50 % off. Hope Blossoms Mineral Bath Salts ($22) 10% of proceeds will go to National Breast Cancer Research. 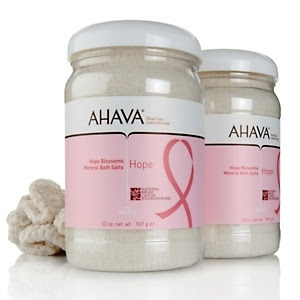 With any Ahava purchase, you will receive a free "give a little hope get a little hope" bath salt gift, $7.50 value. Tweezerman Breast Cancer Awareness Slant Tweezer ($20) $18 $1.00 of all proceeds will go to Breast Cancer Awareness Research. 100% of the proceeds go to the Women's Research for Cancer Fund. Well worth the purchase if you ask me!